As a child, I loved to draw so much that my parents sent me to art classes when I was five. “Fruit, Wine and Sunshine”, an oil painting, won a blue ribbon at the county fair when I was six. Weekly art lessons continued into my teens. I always painted, even in my dorm room and in rare spare moments in school. As a woman in the 70s I felt that a path to sustainability in art was not viable so I was involved in another career. But in 2013 I began again to paint again with acrylic en plein air, using palette knives for an impasto effect. 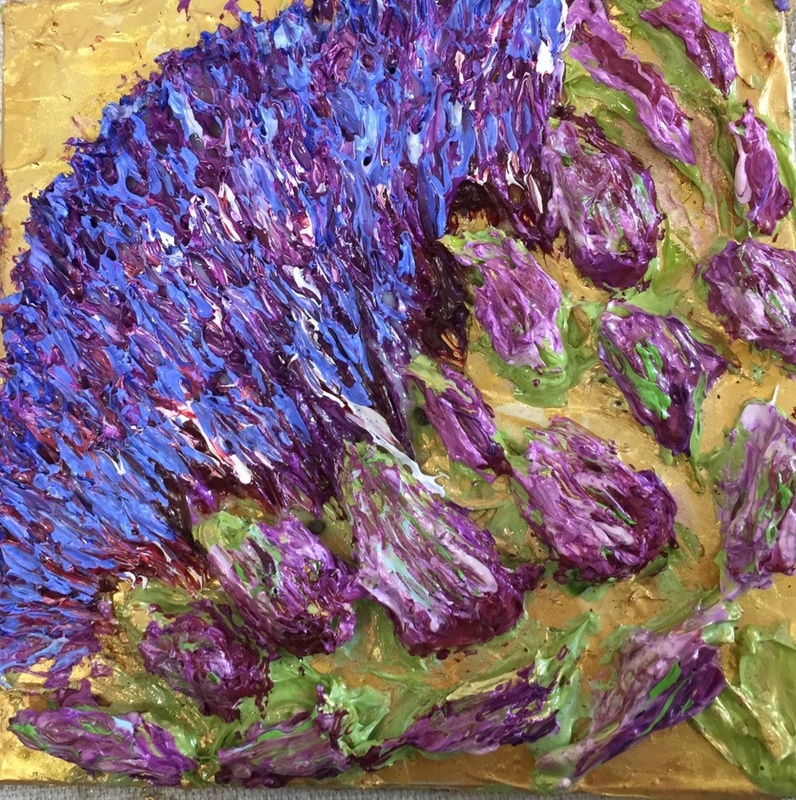 I find myself dedicated to using palette knife exclusively to encourage looseness and coloring outside of lines and formats There are so many different pallet knives today and in the hand, each one inspires a different stroke. I began to paint outdoors for the first time in 2014. Then I took art classes in Florence for two weeks and painted en plein air in Tuscany. I see my hand and eyes as a kind of conduit of light and color from nature, flowers, sunlight, beaches, earth and sky via the media. I feel uplifted into a different dimension, even merged with nature as endorphins are released in my brain by the color and sunshine. Acrylic is a modern medium and the palette knife and acrylic together are tools for texture that have embedded themselves in my DNA. Above all, I want my work to be “a thing of beauty.” My own soul needs to find a way to look at and express the beauty that I see for my own good and enlightenment. And, I hope for others as well it can represent a focus that doesn’t deny pain and sorrow, but lifts the sight beyond it.